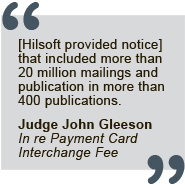 Hilsoft Notifications is a leader in the industry of designing notices that are attention-getting and written in clear, concise, plain language. 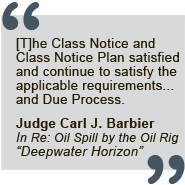 Notices must carry significant legal concepts and provide complete information, yet be conveyed in a way that class members can understand. Our extensive knowledge of class action law and legal terminology allows us to write and design simplified notices that fulfill all notice content requirements. We can transform even the most complex settlement into notices that class members can easily understand. Our notices are designed to motivate class members to view and understand the notice and clearly outline class members’ rights. 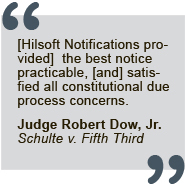 The strategic approach to content and design of our notices is entirely consistent with the illustrative “model” notices developed by the Federal Judicial Center and satisfy the plain language amendment to Rule 23.